High quality photos are important. A good resolution for printing photos is 300 dpi (dots per inch). Anything below will print pixelated. Most images displayed on a monitor has a resolution between 72 dpi and 96 dpi, which means it may look great on your monitor but will not look great when printed. Set a deadline for pictures being submitted and specifications for 300 dpi (dots per inch). Plan your picture day far enough in advance so it is convenient of all participants and doesn’t interfere with the production of the book. 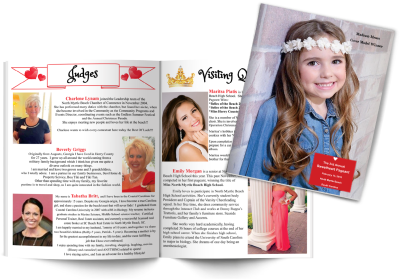 Showcase a picture or collage of photos on the cover of your program best describing your pageant. In the image above, Page 1 is the Front Cover. The Inside Front Cover is Page 2. The inside pages continue in order, Pages 3, 4, 5 & 6. The second to last page is the Inside Back Cover, Page 7. The last page is the Back Cover, Page 8. Pictures from previous years’ or other past events. The process was easy. My programs looked tremendous, and The Printing Center had delivered to me well before the deadline I needed. Simple, easy to work with, and I could not beat the price locally. Will use again. The program that i received looked great and i received it on time. As always great quality and fantastic staff to work with. This is my 4th year using PrintingCenter USA. They always deliver a high quality product and do everything possible to meet my in hand deadline. Will continue to use them!!!! Excellent service and product! This is the second year we have used Printingcenterusa for our event program. Once again they did a super job. We highly recommend them for any of your printing needs. They offer fast service and competitive prices with a high quality finished product. Most important is the great communication during the entire process. Okay, so there is something about their website that made me feel like it was maybe a scam? I think it's the logo that made me feel like that for some reason...in addition to their prices being unbeatable! Always a little wary of a reallly good deal. lol. However, I gave them a call and the woman on the phone was lovely so I went ahead and placed the order for our program books for our film festival. They arrived in ample time, nicely packaged in manageable chunks (which I've seen other companies charge for) and the print job is beautiful! I will be using them for everything in the future! Wonderful experience. Fast printing and shipping with quality product. Thank you so much! I felt like the shipping was misleading. What was said to be 3 day shipping, which I know was from the time the proof was approved, ended up going to be almost 2 weeks. I ended up having to pay an additional $36 in shipping and the product still didn’t make it in an enough time to have at our banquet. Thank you EMILY for making this right!! I appreciate you handling the issue appropriately. I can see the company has great values. Thank you so much. The programs looked fantastic. I couldn't be happier with the way they turned out. Excellent production quality at great prices. The product was great, it came fast, and the customer service was excellent. The rep I dealt with responded to emails almost immediately. He was very helpful and made sure everything came on time. Terrific job done on our concert programs. Will definitely recommend you to others. Excellent quality service and quick...Impressive...Fair pricing...Will be back with more orders. Very professional with great communication during the entire ordering and printing process. The product was first rate quality. We received countless praise for the quality and appearance of the publication which was an integral part of our event. Pricing and production times were competitive. We are very happy with the finished product and will certainly do business with Printingcenterusa.com again. Product quality was great! They arrived on time and in great shape! Thank you! We had programs printed for an awards banquet. The staff was very efficient and easy to work with. Phone and emails were answered quickly and the project was completed with great satisfaction. The printing quality and price was excellent. I put my order in on Monday afternoon, approved my proof that evening and had my programs Thursday! Mike was super helpful and made sure I had exactly what I needed. Thank you so much for helping me get them in time for my event! They were amazing! Everyone loved them! Beautiful quality and would like to order again. I'd recommend to anyone. Very professional, excellent quality, competitive pricing, great customer service. Thanks to PrintingCenterUSA our programs look better than Broadway Playbills. PrintingCenterUSA has become my go-to company for brochures, posters, programs, and more. They have consistently had great work, they've never missed a deadline, and are easy to deal with. Quality, service and such was incredible. I was a tad concerned when the proof email said everything was low res, though in PDF form, but because of our tight time line had no choice but to let it go to print. Myself and many others have the belief if what we got was with low res, high res would be outrageous in clarity and quality. Thank you for making my first conference's programs beautiful. The programs were AMAZING! They got my job finished so quickly - even faster than they had to! Love this company. Excellent printing and I received my order in 6 days. Great looking programs, Staff was very helpful and answered all my questions. Company was very easy to work with. Staff not returning your call to answer a question about an order that had been received is very unprofessional. I ordered a conference program. The instructions were easy to follow, the turnaround was quick, and the quality was as promised, and very good. Am very happy to have found this company. Recently printed our second annual concert program (booklet) and have been very pleased and impressed both times. Supporters, advertisers, concert go-ers, and venue owners have raved about the quality and look. As a designer, the colors come out great and I can't say enough. Great job PrintingCenterUSA!! Completely amazed at true turn around times. Everything was perfect. We will be using again and will recommend to every sport booster club around! Professional, fast, and exceptional customer service!!! This company was AMAZING to work with! VERY patient and responsive. The end product (a sports event program) went above and beyond our expectations and was received well by our athletes, families, and fans. Would highly recommend using printingcenterusa.com!!!! They were great to work with!! I was in a time crunch and they helped me to get my fabulous product in time. I ordered a program for an event and got so many compliments on the quality of the product. It was perfect! I will definitely be ordering again! Thank you! !